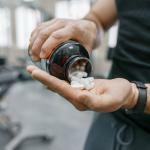 Performance Lab Whole-Food Multi is a game-changer that finally gives us what we are looking for in a multivitamin supplement: Clean, pure, health-enhancing nutritional essentials…. And nothing else. Let’s take a closer look in this Performance Lab Whole-Food Multi review. BioGenesis™ Nature-Identical Essentials. Lab-grown cultured vitamins and minerals that are more bioavailable and active than isolated nutrients. Performance-oriented. Designed to boost every cell in the body to a state of good biological performance and robust overall health. 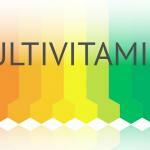 Clean multivitamin nutrition. Grown in a sterile laboratory, additive free, and delivered in vegan prebiotic-infused Plantcaps®. Suggested Use: Take 4 capsules daily. Best taken as 2 capsules, twice per day. Take with or without food. 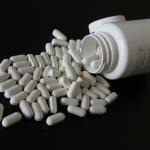 For men and women seeking additional nutritional reinforcement, up to 6 capsules daily may be taken. Just clean, pure vitamins and minerals in a new, patented form. Performance Lab Whole-Food Multi is a high-quality, clean-label multivitamin. But the big draw here is a nutritional innovation not seen in any other multivitamin on the market: BioGenesis. Performance Lab “grows” BioGenesis vitamins and minerals in a clean hydroponic medium housed in a sterile, tightly controlled laboratory. First, seed micronutrients are introduced into growth cultures of probiotics and brewer’s yeast. As the cultures grow, they organically produce nutrients that are identical to vitamins and minerals found in the foods we eat. To be more specific, these vitamins and minerals are bound with enzymes and cofactors – unlike synthetic nutrients where vitamins and minerals are split off and isolated from their cofactors. BioGenesis nature-identical nutrients are more bioavailable and biologically active than synthetics in other multivitamins. With next-gen BioGenesis vitamins and minerals, Performance Lab Whole-Food Multi may unlock the full potential of vitamins and minerals, giving you a strong foundation for overall health and peak life performance. From a practical standpoint, Performance Lab Whole-Food Multi supplies at least 100% daily value of over 17 essential vitamins and minerals. This is not a megadose formula. It’s also not loaded with random nutritional bells and whistles that have nothing to do with a multivitamin’s true mission. Performance Lab Whole-Food Multi instead supplies a balanced multivitamin profile that is much easier for the body to absorb and utilize. In a way, it’s a “Back-to-Basics” multivitamin. But those basics — when delivered as advanced BioGenesis nutrients — can be real game changers for health, energy and overall life performance. BioGenesis is eco-friendly. These cultured nutrients don’t require agriculture or mining to produce, they don’t need to be shipped all over the world, and they never see pesticides or herbicides. BioGenesis are minimally processed vitamins and minerals, as pure as you can get. As you can see here, the Performance Lab Whole-Food Multi is currently the cleanest multivitamin supplement on the market. 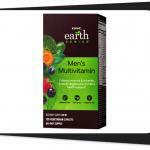 It is refreshing to see a multivitamin that delivers just the vitamins and minerals, and no dirty-label nonsense. Naturally supplies a small amount of probiotics, due to nutrients grown in a probiotic culture. Is delivered in vegan pullulan Plantcaps naturally supply a small amount of prebiotics. This means every Performance Lab Whole-Food Multi capsule has a synergistic mini-stack for absorption and comfort: Probiotics for digestive health, and prebiotics to feed them and help them thrive. The thinking behind this digestive-supportive design speaks volumes about the quality of Performance Lab Whole-Food Multi as a whole. Not a single detail is ignored. True respect is paid to the power of vitamins and minerals. Performance Lab Whole-Food Multi is formulated with precision in order to deliver the best possible nutritional benefits. 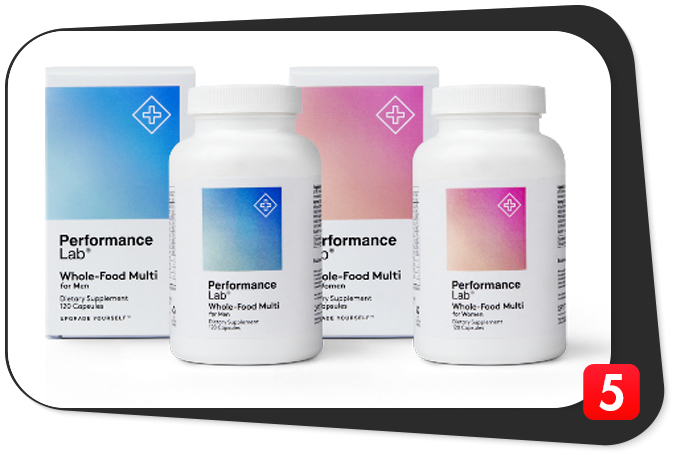 Unlike some trendy multivitamins on the market, Performance Lab Whole-Food Multi is laser focused on a single benefit: nutritional wellness. This formula features novel new vitamin and mineral forms intended to restore healthy nutritional status in every cell in the body, efficiently and completely. Performance Lab Whole-Food Multi puts this nutritional restoration in the context of “whole-life vitality.” With the idea that by enhancing biological function in every cell, you support healthy function throughout your whole body. Ultimately, Performance Lab Whole-Food Multi is intended to build a healthy foundation that starts in every cell and extends to support every body system. Performance Lab Whole-Food Multi the may be taken by anyone seeking a clean, fundamental multivitamin product that is elevated with premium materials and a groundbreaking new nutrient form. Nope. That’s the whole point. Performance Lab Whole-Food Multi avoids the use of any and all synthetics, colorants, unnecessary fillers, and isolated nutrient forms. Because its nutrients are nature identical, they are easy to absorb and comfortable on the stomach. If anything, the probiotic-cultured nutrients and prebiotic infused capsules might combine to actually improve digestive health and comfort. Clean manufacturing. BioGenesis nutrients are made using clean technology, in a sterile facility, with virtually zero carbon footprint. Clean delivery. Look at the label and you will see — n0 additives, just vegan plant capsules made from natural pullulan. Balanced doses. There are no megadoses in this formula; just proper doses, improved with bioavailability and bioactivity enhancements. A little pricey. 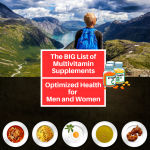 Better to pay a little more for a multi brimming with biological activity that boosts your health than to get a cheap deal on a dead, inert multivitamin loaded with synthetic nutrients. This Performance Lab Whole-Food Multi review details a clean, pure, no nonsense multivitamin nutrition in an advanced form that works in harmony with the body. Featuring careful attention to detail, top-shelf quality touches and a proprietary new class of BioGenesis nature-identical nutrients that unlock peak vitality support, Performance Lab Whole-Food Multi is the cleanest, leanest and multivitamin product on the market today.